Custom order season is upon us. Weddings, graduations, Mother’s and Father’s Day. Customers love customization and being able to ask for truly unique items. But it can be pretty scary taking this leap when you’re used to making your own choices when it comes to your creations. 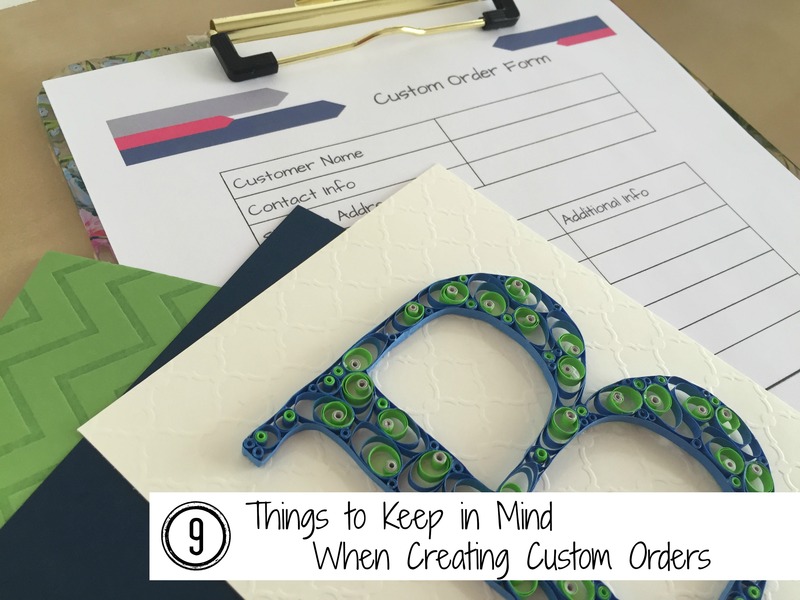 Here’s a list of 9 things to keep in mind when creating custom orders. 1. The true custom order versus a variation. Is this new item a version of something you’ve already made or a creation that is a totally new idea? It might not seem like it would make a difference at first, but take this into account when pricing your custom item. If you’re creating a brand new design, do you need new materials? What about the right packaging materials? You also need to add in the time it will take for the design process. All this adds up. It is your time, so account for it! This might seem really basic, but I always double-check that I have all the contact information spelled correctly. There are a lot of alternate spellings of words these days. Make sure you have the right email address so you can send all those awesome photos of your progress! Be as clear as possible with your customers. Quite a few will defer to your professional opinion (it still makes me giggle when someone calls me a professional). Some may be very specific with what they had in mind. But misunderstandings can happen, so do what you can to explain the specifics of the design. Can you compare the colors to something common? If you sell micro-size items, think about taking a photo next to a coin or ruler for comparison. 4. Be as accurate as you can with timing. Custom orders are a gift more often than not. And gifts are usually given on specific days. Don’t underestimate how long a custom order might take to complete. Being late to deliver will only lose you a repeat customer. I’d rather overshoot by a few days, and surprise my customer with an early finished product. 5. Should you take a deposit? It can be super uncomfortable, but this is where you have to put your businessperson pants on. There are plenty of crafters with stories of commission clients that were never heard from after placing their order. Taking a deposit might not cut this possibility, but it greatly lessons the chance. The rate of the deposit is up to you, of course. Consider the price of the product, time needed, and chance of the item’s ability to be sold if the custom order falls through. 6. Can the custom order be returned? In general, probably not. This is where lots of updates and approvals can come in handy. I would state your return policy up front to save any hassles later. 7. How often do you send your customer updates? It might just depend on the customer. I’m a fan of letting them know when I make major decisions, at the least. Some clients are very uninvolved, and give you permission to do whatever you think is best. Some might be more hands-on, and want to approve every step. It can be a little frustrating as a crafter to lose this much control, but it is part of the process of custom sales. Just breathe through it. 8. Is it copyright infringement? A lot of custom orders often involve logos, mascots or any other number of copyrighted material. Is a sale worth getting fined or dinged by lawyer’s fees? For me, no. The whole situation just makes me queasy. There are times when I have been approached to make a custom order that is completely out of my comfort zone. Maybe it’s a style that I don’t normally work with or a plan that might not gel with quilling at first glance. I’ve had to decide whether I can do the design justice or is this an idea that I am not comfortable with. Don’t be afraid to try new ideas, but don’t be afraid to say no. As much as I would love to accept every commission, I have been known to pass along other artists’ names who I think could do a better job. Call it crafters’ karma. Creating custom orders is an amazing way to expand your shop and gain repeat customers. It may seem scary, but it can be a wonderful process and a great way to reach a new audience for your work. And to help, here is a copy of a custom order form for you can use to help in your order organization. I even take a few to craft shows so I can start the process right away if it comes up as I’m selling! Be realistic but adventurous. Your next custom piece might be the starting point of a whole new line of items for your business!